I recently finished The Deed of Paksenarrion which is an omnibus collection of the books Sheepfarmer’s Daughter, Divided Allegiance and Oath of Gold by Elizabeth Moon. The entire collection of books is 1501 pages long which averages to around 500 pages per book. The book length seems to be about average for the fantasy genre. I feel these books have several elements that make it stick out from others. While other books do have female protagonists, they are not well represented in traditional fantasy. I feel this is changing in more recent in fantasy literature and I feel this book gets a female protagonist “right”. While Paladin’s appear in other fantasy literature I feel this is the first book that I have read that really makes the Paladin more than a two dimensional set piece for the story. On the same note I feel the concept of fantasy world religion is mush better developed in this book than some others I have read. The first portion of the book starts very low magic with life as a mercenary. It later increases the magic level of the book but I appreciate the grittiness of mundane military life portrayed in the book. Sure there the elements of Paladins, Clerics and deities that resemble Saint Cuthbert but the parts that got me was the parts that go full dungeon crawl. If you have played a fantasy table top game before, you will recognize when this happens. If you haven’t and you like this book, you might give table top role playing a try. 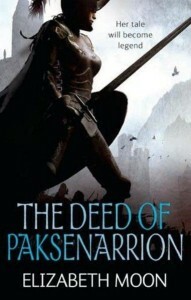 On a side note, why did the cover artist put Paks in plate armor with breasts? She wore boiled leather and chain mail through most of the book. I guess that just proves that cover artists often don’t read the books. Overall I enjoyed this book and I would recommend it to others. I’m glad my friend Scott Kesilis recommended it to me.